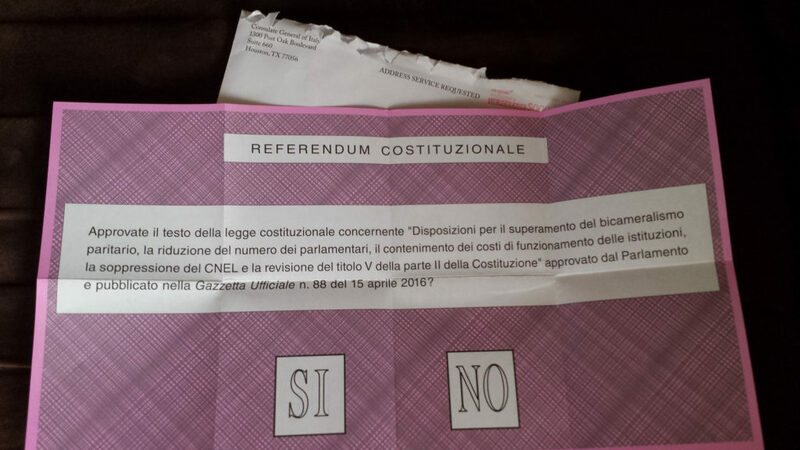 My ballot for the Italian Constitutional Referendum, before I marked it and sent it in. A week after I voted in the U.S. presidential election, I sent in my ballot for the Italian Constitutional Referendum, which is taking place on December 4th. The referendum is a rather complex beast which I suspect a lot of Italians who live in Italy don’t altogether understand, let alone those of us Italians by blood who live elsewhere. It is billed by its proponents as a series of reforms intended to make the Italian government more stable and efficient. That’s an admirable goal, especially in a country like Italy, where the bureaucracy often moves at slower than a snail’s pace, and where good-ol’-boys networks often dominate. But the problem in this case is that the medicine may turn out to be worse than the disease. That, at least, is the opinion I hear and read from a lot of people, both in Italy and outside. The referendum’s chief proponent is Prime Minister Matteo Renzi, who has stated that he would resign if the referendum fails. The “yes” proponents, as well as some news outlets and commentators, are predicting chaos if “no” wins — from political chaos in Italy itself, to the absolute disintegration of the European Union. I think those fears may be a bit overblown. The main point in the referendum is a reform of the Italian Parliament, which is made up of two chambers: the lower “Chamber of Deputies” and the upper “Senate of the Republic.” One problem with the stability and efficiency of the government is that a law cannot be enacted unless both chambers pass the legislation in exactly the same form. This means that a bill just keeps going back and forth from one chamber to the other until, finally, at long last, maybe, the exact same language may pass both houses. At that point, the bill can become law. But the process is inordinately slow and unwieldy. The referendum’s solution to this is to drastically reduce both the membership and the power of the Senate. The Senate currently has 315 members who are elected by the voters. Under the reforms, the Senate would have 100 members who are appointed by regional authorities. The Senate would also be mostly taken out of the legislative process — being reduced in most cases to an advisory role. Thus, all but the most important legislation would simply need to be passed by the Chamber of Deputies, essentially making the Italian Parliament a unicameral legislature for most purposes. But it occurred to me while thinking about these issues that the U.S. Congress solves this same problem in a much simpler way: When a piece of legislation passes the House in one form and the Senate in another, the two houses create a conference committee, work out a compromise bill that all can agree on, and then that bill is sent back to both houses for a vote. Voila! No endless back-and-forth changing a word here or a paragraph there every time. No years-long deadlock because two chambers can’t agree on exact wording. Instead, a simple solution. And the compromise bill is voted either up or down. This thought demonstrated to me that the Italian referendum is indeed medicine that’s worse than the disease it’s trying to cure. Altering the Senate is only one of a myriad of changes to be enacted by this legislation. It is complex, unwieldy, draconian in some ways, and somewhat anti-democratic in others. It removes a great deal of representation from the people. There’s been a good deal of discussion of the referendum in a dual citizenship group that I belong to on Facebook. (And we can actually discuss politics without calling each other names!) Most of us appear to be coming down on the side of “no” because of these considerations. From what I understand, the views in Italy are much the same. Reforms are indeed necessary. But I don’t think these particular reforms are the way to go about it. They seem worse than the original problem. Previous Article Double-neck Guitar Project, Part 1 – Will It Work?